Statistics provided by the National Highway Traffic Safety Administration demonstrate that around 56,000 accidents occur each year in America as a result of fatigued driving. Fatigued driving is defined as lacking adequate amount of sleep, overworking, or performing strenuous work or exercise among other factors. Studies show that the number of hours spent while driving have a direct correlation with the number of fatigued driving accidents across America. Have been involved in an auto accident that was caused by a fatigued driver? At the law offices of The Tapella & Eberspacher Law Firm, our car accident attorneys believe that if you or a loved one has been injured due to another drivers negligence, the victim may be entitled to compensation for their losses and damages including; pain and suffering, lost wages, property damage, medical expenses, and funeral expenses. For more information, complete our “Free Case Evaluation” form to the right – It’s completely free. As studies show, the early morning hours and mid-day afternoon are the most common times for drowsy driving accidents to occur. This is typically due to the lack of sleep or other factors causing the driver to operate their vehicle while being fatigued. If you believe you may be drowsy driving, our attorney’s advise pulling over to the side of the road and resting to avoid an accident or falling asleep at the wheel. Unfortunately, even if we do everything we possibly can to drive while drowsy, we may find ourselves in an accident no matter if it is our fault or not. Accidents caused by an individual having a lack of sleep can be very dangerous, especially if the driver of the vehicle has fallen asleep at the wheel. These types of situations can cause severe damages and injuries to everyone involved. Being involved in an accident due to driving drowsy may cause injuries to those involved; as the driver may not be have sufficient time to react to the stimulus of the accident. 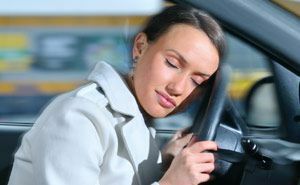 When an individual decides to sit behind the wheel of a vehicle without an adequate amount of sleep or rest, they are putting everyone in the surrounding area at risk. These drivers have large decrease in reaction time which may cause them to become involved in an injury causing accident. If you have been injured in a car collision, it is recommended to seek medical attention for your injuries. This will assure all injuries have been properly cared for and also provide our attorneys with the documents to form a robust case against the injury causing individuals. At Tapella & Eberspacher, our attorneys believe that if you have been the victim of a fatigued driving accident, our law firm can help you fight for your rights. Our attorneys have been representing auto accident injury victims for several years and will put this to use for each or our clients. With locations in Charleston and O’Fallon, Illinois and St. Louis, Missouri we are able to offer injury victims throughout the great Little Egypt and Missouri region with dependable legal solutions. Additionally, our attorneys also serve clients throughout the St. Louis, Missouri metropolitan area. If you are interested in learning more about our firm, call us today at 855-522-5291 for your free no-obligation consultation. Alternatively, start here by completing the “Free Case Review” form on this page and we will contact you shortly.